The crag at World’s End isn’t literally at the end of the world but feels like it as you apply Xeno’s paradox along the twisty single track road from Llangollen. Exceptionally beautiful at this time of year, with wild garlic, hawthorn and elderflowers everywhere and all the trees now in full leaf. It’s real name is Craig-Y-Forwen but I think gets its more poetic title from the nearby World’s End farm. The crag is in a particularly lovely spot within this lovely landscape. 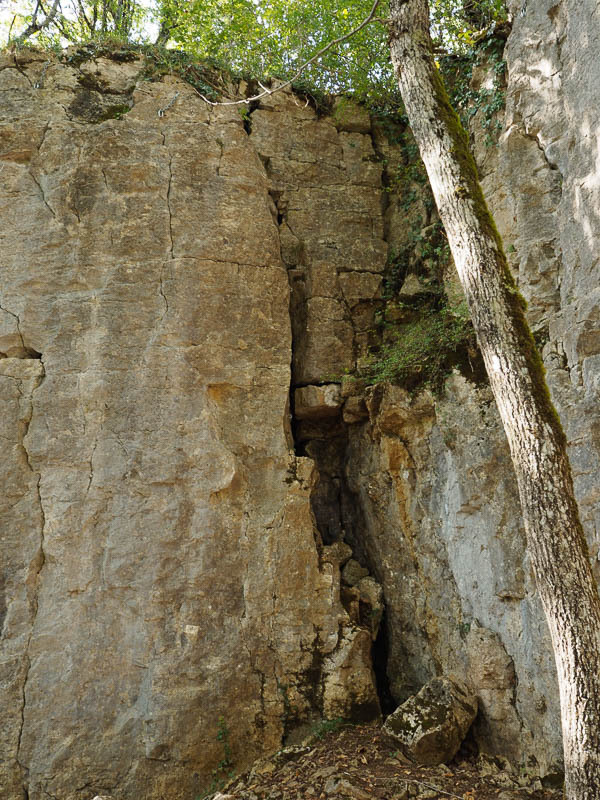 The easiest access is to the right hand end of the upper tier, which is right up against the path and has an easy walk up/down to/from the top of the routes and plenty of useful trees for belays, but watch out for jagged branch ends sticking out just at eye level. 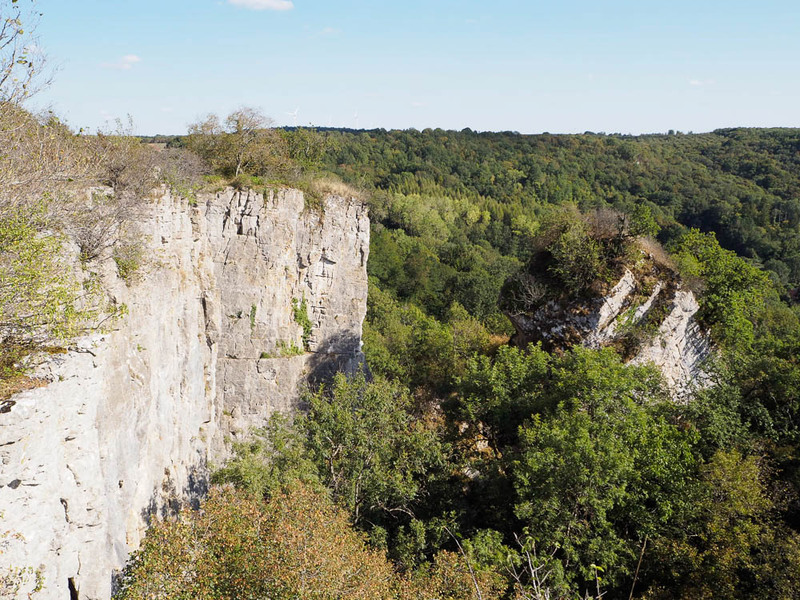 The weather was hot and sunny and with the clean limestone and wooded hills I could easily have been climbing in Burgundy again. As this was our first outdoor session for eight or ten months (see how the excuses come so readily already) we just did a top-roping session. The routes were very polished, which made them feel much harder (more excuses) but we were moving well and climbed them without too much trouble. Our indian summer keeps on giving. 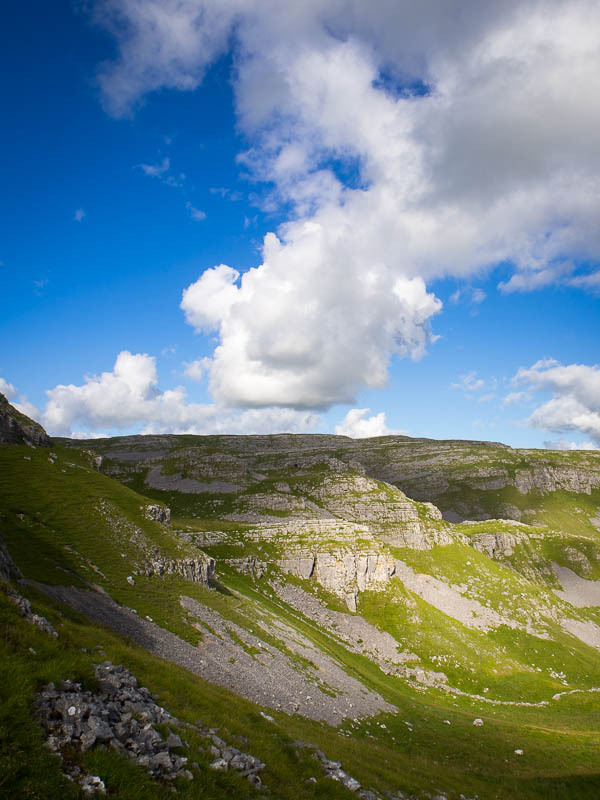 We had a lovely afternoon climbing at Woodhouse Scar with the CMC – Simon, Michael and myself. Simon and I started with Curving Crack. I’d laid hands on the starting move for this last week and couldn’t figure out how to get off the ground but Simon led and showed me the way. It was possible but very strenuous. A good route. 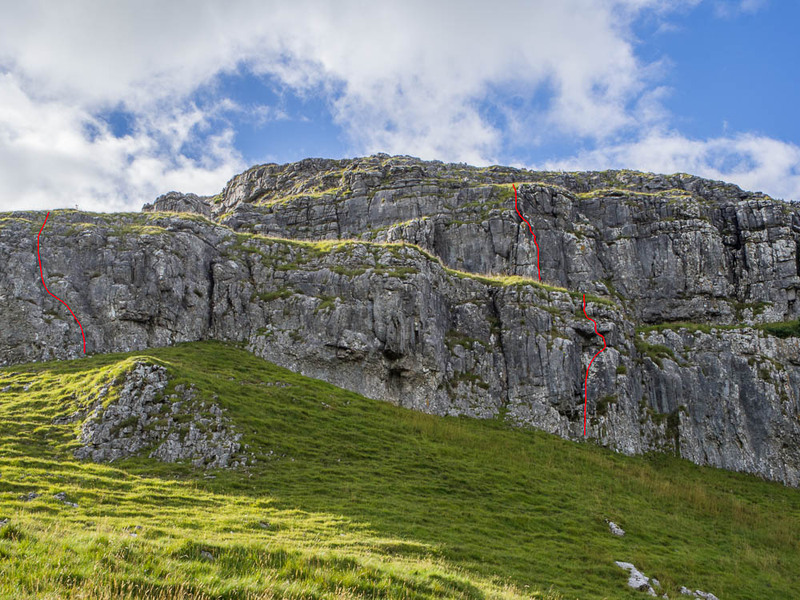 Basin Cracks – Simon led, a very good route with a strenuous start. Jetsam – my lead, first time on this route this year. Original Route – my lead, an easy touch for VDiff. Then a shandy a the Big Six, a secret pub just round the corner. The kind of place you’d never go in (assuming you could find it) unless someone else took you but a really nice old-fashioned pub. I think that’s it for outside climbing this year, it’ll be back to indoors for the winter from next week. It was the CMC’s Yorkshire club meet yesterday and the venue was Rylstone. Joy and I have often climbed there but not for quite a few years. I remember it fondly for the tremendous views and beautiful scenery on a warm sunny day, though also for the cold and winds on less than kindly days. 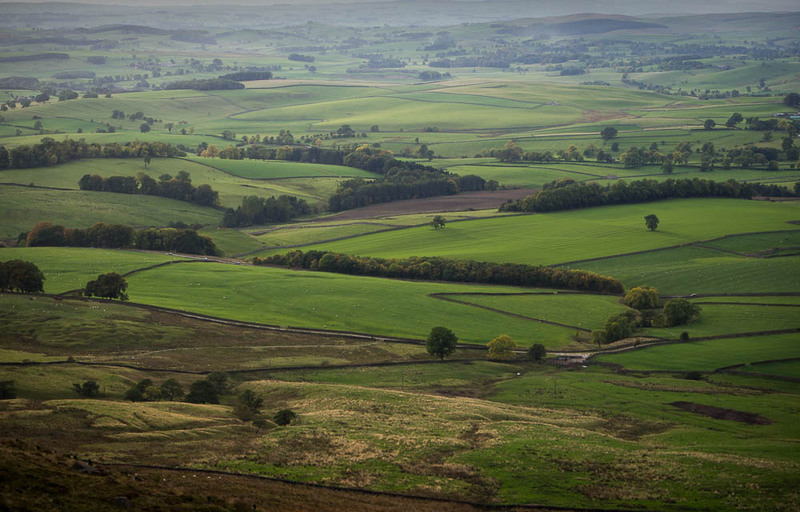 The view south-west from Rylstone crag. Unusually the crag was quite crowded and naturally most people were climbing the popular three star classics. This left us with the very unpopular no-star well named route Sandy Buttress. The book suggests doing it in two pitches but really it’s a single pitch route that’s broken in the middle by a big grassy area. Very delicate, especially in it’s fairly lichenous state, and not a lot of gear. Getting down from the top is “interesting”. We managed a better route next, Forgotten. Only Diff, but a nice line, nice moves and nice rock. Finally, the crag was quieter and it was our turn on the classic easy route of the area, President’s Slab. We’ve done this several times before, though as I said not for some years. It well deserves its three stars with a great line, increasingly exposed as you slant up and right, with perfect rock and great gear to reassure you all the way. I’ve noticed before on climbing holidays that as the days go by I get less and less able to do the routes because I have less and less courage left. Today I ran out, so we did three routes then called it a day. We went to Saffres, a very impressive crag in a beautiful and peaceful spot. Not a single other climber visible, though we did hear some around the corner somewhere, making a bit of a racket. We found out later it was the local mountain rescue team practicing emergency rope techniques. We started on the shortest and dirtiest part of the crag. This is a crag that reaches 40m+ of perfect sunwashed limestone but we chose a pair of 6m dirty chimneys to start with. Easy and unchallenging but we still enjoyed them. Then a slightly harder route. The book said the start was hard and it was indeed something of an off-width struggle up a sickle-curved crack too narrow to be a chimney, too wide to be a crack and too polished to be comfortable. After that short and brutish introduction it turned into an easy, blocky and very enjoyable route. La Vedette – “The start is a bit slippery” says the guidebook. Trying the next route on for size revealed the aforementioned lack of courage so we stopped there, still feeling like we’d had some good exercise after the sickle-shaped struggle. All pictures are straight out of the camera with no post-processing, so perhaps not up to my usual standard. I’m editing on my laptop without my proper external monitor. The laptop has a particularly poor screen that’s useless for any kind of image adjustment. 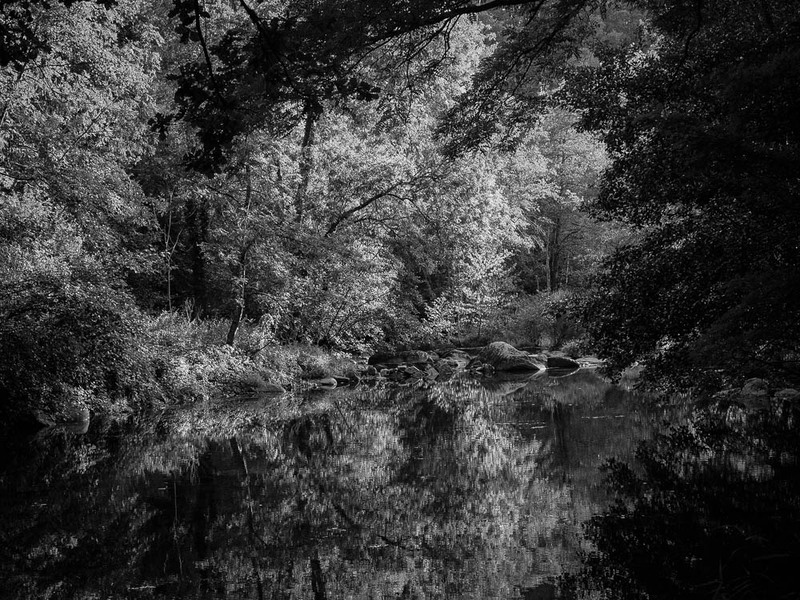 So I’ve just applied one of the lightroom B+W presets to this picture and fingers crossed. I won’t be able to see it properly until I get home again. The french region of Bourgogne, Burgundy to most of the english-speaking world, is famous for its rich food and rich, great wines. Unfortunately the rich food is 99.9% meat-based and we’re vegetarian. The wine is pretty good though and I have a glass in my hand as I type (actually it’s on the floor…take a sip…back on the floor again). 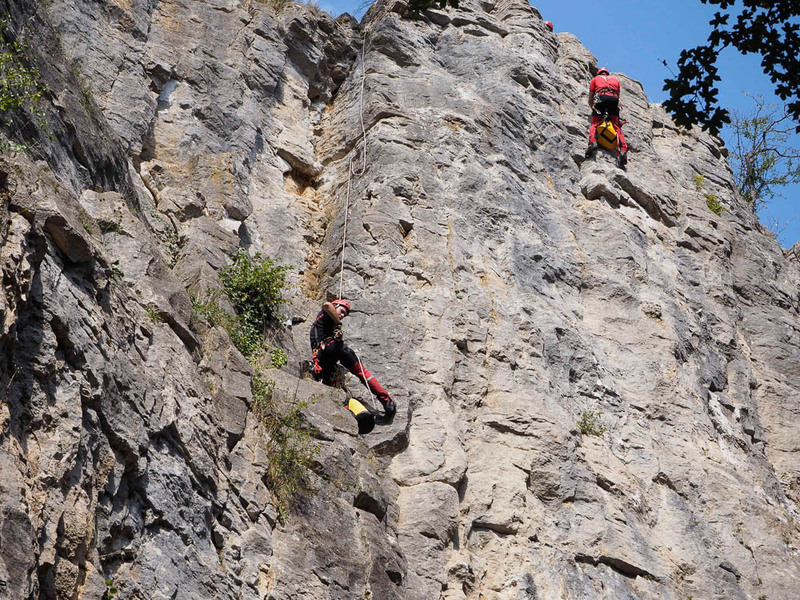 The real secret of Burgundy for the climber is that it makes for a great sunshine sport climbing holiday. 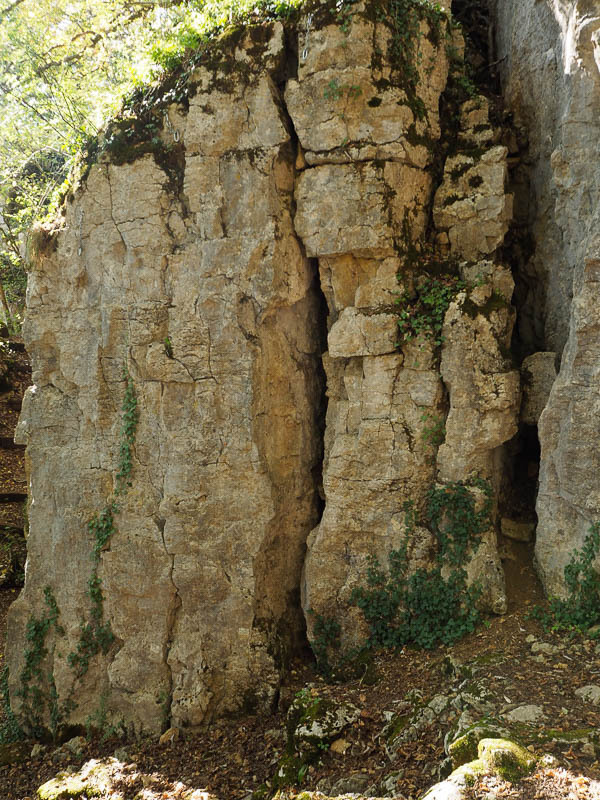 Lots of great limestone and granite crags, many of them road-side, with lots in the easier grades (which we like!) You need to like peace and quiet as there’s not much in the way of night-life. Plenty of eating out in those typical burgundian restaurants – but see earlier comment about being vegetarian. You can get an omelette if you ask nicely… The wine really is good though (takes another sip…back on the floor again). The weather in september is perfect for climbing. Warm but not hot, but with hot enough sun for a nice tan if you want one. Cold at night though. Quiet roads, easy travelling, quiet crags. In real life it was about four to six inches long so hardly a threat. It was sitting in the crack at the bottom of a route we were doing. Didn’t seem bothered by us using it’s home as a foot-hold. 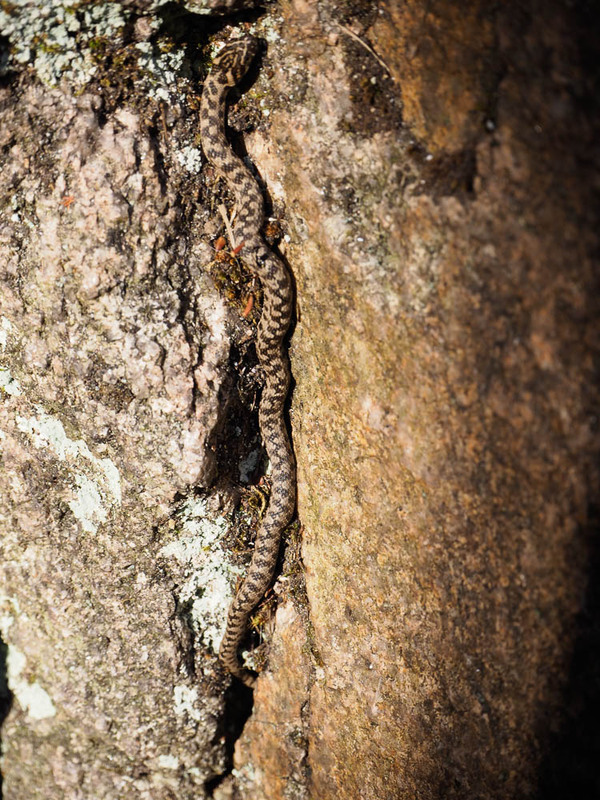 I don’t know if it’s a tiny snake or a slow-worm but the head looks the wrong shape to be a slow-worm. Sorry it’s out of focus. Gear left on the climb. We often judge the success of our climbing by the amount of gear left behind. Leaving no gear is judged as success, it means we climbed efficiently and capably. Leaving some gear is also judged as success. It means we had an adventure. In this case, the top of the route was too hard so I lowered off prematurely. “It was supposed to be dry!” – the usual protest when friends meet up for climbing on a wet evening. It had rained in the afternoon and it was raining now. Heptonstall gritstone isn’t Skye gabbro and rain doesn’t agree with it much. However, bearded Chris had asked me last week for some tuition to help him start lead climbing. Despite being a hard-man boulderer he’d never done any leading so I thought we’d do some top-roping and I’d get Chris to set up the belays as though he’d just led the route. We started on The Mitre (severe). The belay for this is easy, two handy trees some way back. I showed Chris the basic principles of finding the line of pull, finding pieces in opposition, how to sling the trees, the difference between D-shape and HMS-shape karabiners, and then the standard pattern of tieing on. I got him to tie on to the end of the rope (as though he’d just led) then clip into each krab and back to a clove-hitch on his harness to end up with two independent loops. Then how to work out the best way to sit at the stance. As we were doing this, original Chris arrived so we used him as a guinea pig and bearded Chris brought him up the route. Then they swapped. I was enjoying the teacher-role and not enjoying the rain so I didn’t bother. Then we moved to Badge Climb (VDiff), chosen because it’s got a trickier belay setup. 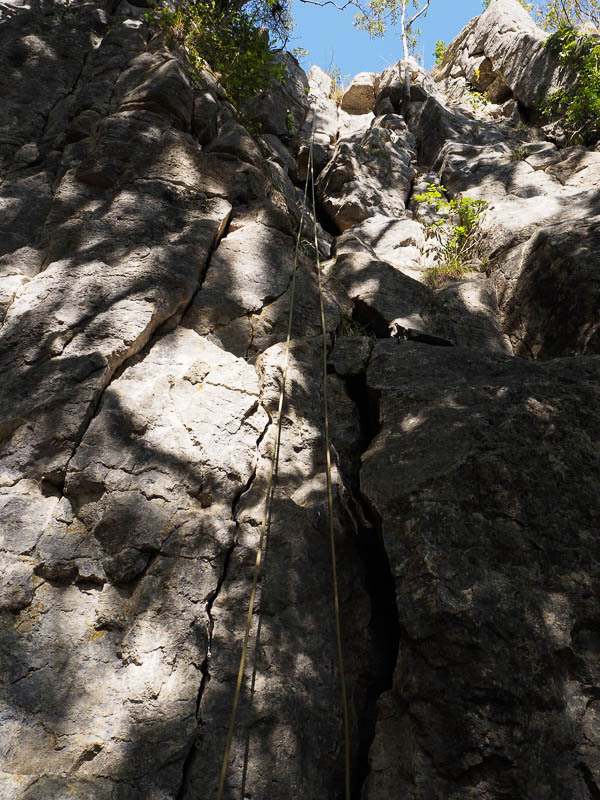 I showed Chris how to judge the line of pull on this route, which is less straightforward, then how to find nuts in the cracks some way back. We used three pieces with two of them equalised into a single point. Next Pocket Wall (MVS), which is harder again (both to climb and to anchor). This time we used four pieces but they didn’t all get stressed equally. We designed it to allow for a pull in two different directions, because of the way the climber moves around near the top. Original Chris wanted to practice Mille Feuille (MVS) to finish, so that’s what we did, repeating the belay setup we’d used for the Mitre earlier. It did dry off a little as the evening wore on and there was a good fiery sunset. We’ll see if Chris fancies an actual lead next time. Got to go and dry out my gear now. Doing a VDiff at Attermire you realise how familiarity makes climbs easy. I’ve got so used to Woodhouse Scar and Heptonstall over the last few years I’m really getting their routes dialled in. I haven’t been to Attermire for a while, I haven’t tried this particular route before and its Yorkshire limestone, which means loose and vegetated (no doubt howls of protest from Yorkshire limestone fans). Looking south-east from the main buttress area. 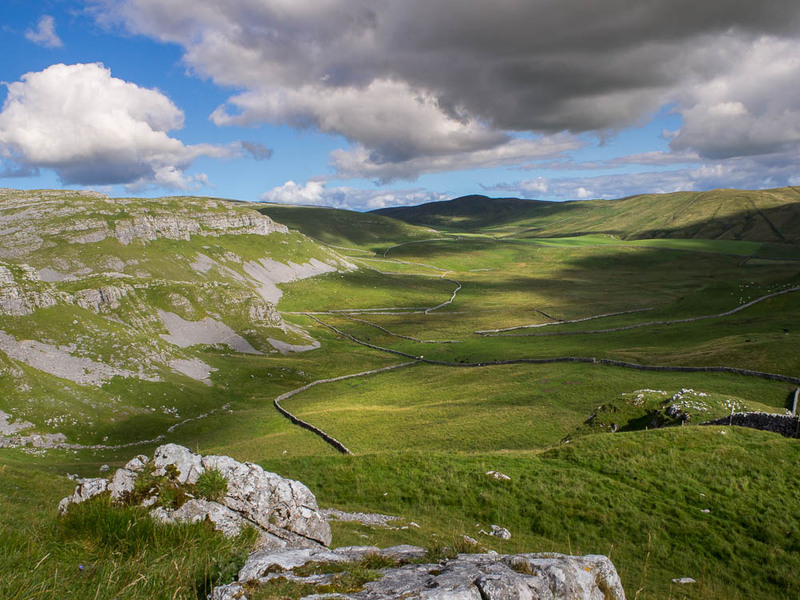 Attermire is a spectacular crag from a distance, a little known wonder alongside Malham and Gordale Scar with amazing views west, south and east. Quite a few walkers below but not a single other climber. Joy has done hardly any climbing for a few years so I had a good excuse for doing easy stuff. We started on a Moderate, Descent Route (i.e. so easy that it’s used as a descent route) and it was straightforward but still pleasant. The Gangway is the VDiff mentioned at the start. Plenty of vegetation at the bottom and some suspect rock but it leads to a much cleaner section in the middle. The crux is high up and exposed and you need what guidebook writers often call a positive approach. The final few moves are through grass, with grass handholds. Quite a nice route, all the same. Plenty of gear, though every piece I placed seemed to put up a fight. We were now on the catwalk between the lower and upper tiers so we moved straight onto another route with a name to do my reputation no good – Easy Man’s Way (Diff). Pleasantly clean and solid this time, the crux section at two thirds height gives very nice exposed moves on big holds but then leaves you again on vertical grass for the finish. Can’t complain really, at least it’s comfortable to sit on as I bring Joy up. Part of Main Buttress with our three routes marked – on the lower tier The Descent (M) is on the left and The Gangway (HS) is right, and Easy Man’s Way (Diff) is on the upper tier. 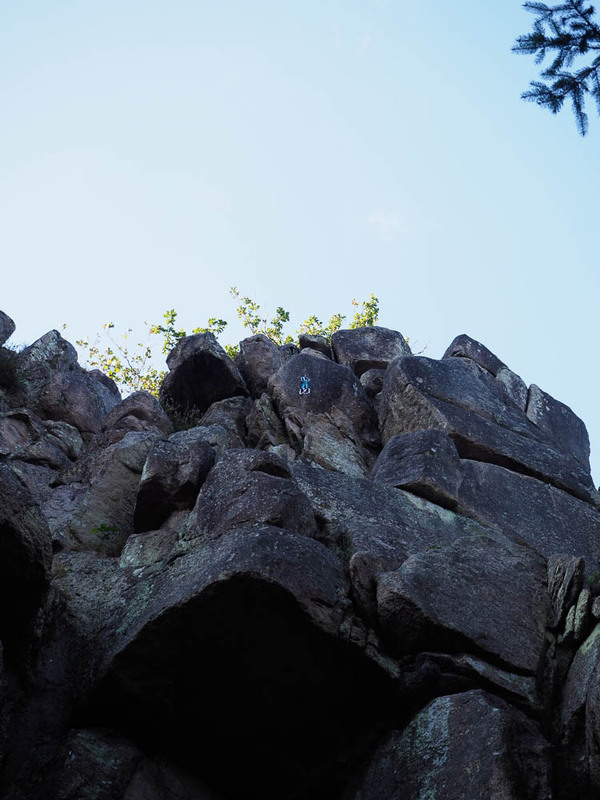 The other thing that makes climbs seem easier or harder is knowing the grade. My old limestone guide gives The Gangway VDiff, so that’s what I expected. If I’d known the UKClimbing entry now gives it Hard Severe I might not have bothered. Glad I did though. Barrell Buttress is in the centre of the picture.